Let us turn our attention again to Flemish painter-entrepreneur and diplomat Peter Paul Rubens. He married artist's model Isabella Brant in 1609. He was 32. Brant was 18. She died of the plague in 1626, when she was 34. Rubens remarried four years later. He was 53. Hélène Fourment was the 16-year-old daughter of a friend. 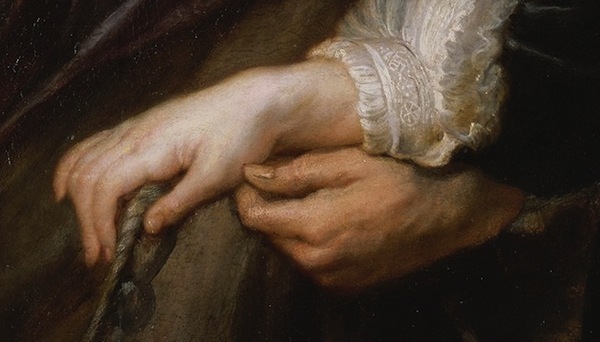 Rubens and Hélène had ten years together, and then, after a remarkably full and diverse life, he died. ca. 1635, oil on wood, 80 1/4" x 62 1/4"
He is 58 years old in this painting, and Hélène is 21. Frans is 2. We know it's Frans and not, for instance, a girl, because that blue sash is training him to expect to carry a sword. It echoes the baldric Rubens himself is wearing. Little girls didn't wear the sash. I was told this fascinating detail by Walter Liedtke, the painting's curator, who disagrees with much of what I am about to say about this painting. If you want responsible historiography, you should consult with him -- and he has left many notes at the Met's webpage for the painting; I myself speak, as ever, as a practitioner and enthusiast of painting, responsible to no eye but my own. This is a painting of a family: husband, wife, son. The composition centers on the lone woman. Both of her men turn their gazes toward her (Rubens originally faced the viewer, but thought better of it and painted himself over). Hélène's neck and chest are the brightest points in the painting -- much brighter relative to the rest than they appear in this reproduction. Hélène is flushed and her mouth is open very slightly. As Rubens paints her, she has a tendency to sweat at the forehead, and to pant and flare her nostrils when she exerts herself. Her body is large and her head small. Her flesh is overflowing, she has the casual sexiness of abundant youth. She will eventually settle into fatness, but for now, everything is gravity-defyingly lush, as lush as the nearly pornographic "garden of love" in which the family strolls. Her gaze is ambiguous. It hovers near her son, but not on him. It is fairly inward-turning, the warm blank gaze of the tolerant object of adoration. She is not as active here as she is in many of Rubens's paintings of her. For all that she is the center of the composition, this painting is not about her. A mannequin who looks like her stands in for her, so that the real action, conveyed in the gazes of the men, can play out and the real lead of the painting can make his statement. The lead of the painting is Rubens. 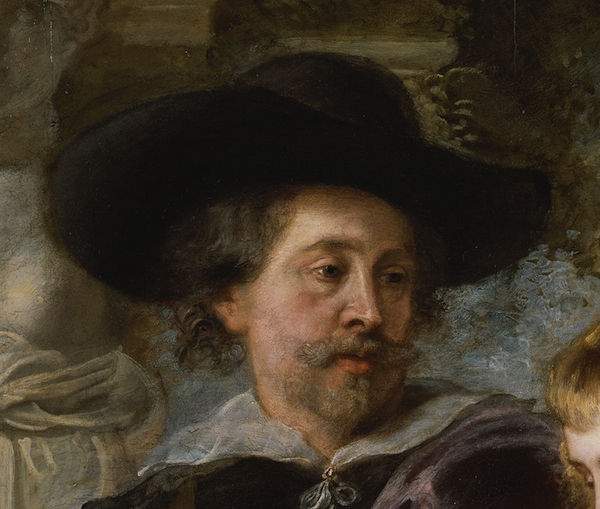 The repainting indicates that Rubens did not understand this until he had been working on it a while. By now, he is already suffering from the gout that will first end his painting practice through arthritis, and finally kill him. As he depicts himself, his beard partly conceals that his jawline is dissolving into his sagging neck. He does not look old quite yet, but the bags under his eyes are headed in that direction. He is wrapped up in Hélène but his devoted gaze is informed in a way that youthful love is not. Youthful love loses itself in the love object. 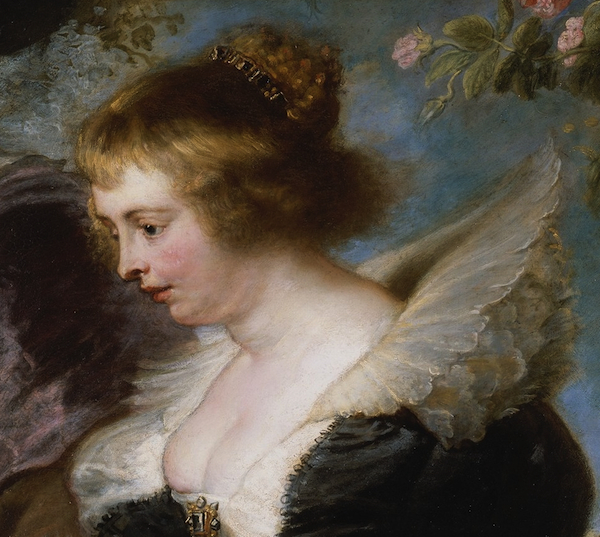 Rubens does not lose himself in Hélène; his burden is too heavy to lay aside altogether. Rather, his devotion and his burden interact, and he learns things from the interaction, and teaches them to us. Sam Peckinpah's 1969 movie The Wild Bunch is, in my opinion, the equal of anything Fellini or Antonioni ever shot. It is a profound movie, not only exciting but wistful, tragic and empathetic. During one respite from the violence, leader Pike Bishop (William Holden) wryly watches his gang of aging galoots trying to pick up the women in a Mexican town. He asks the wizened local sitting beside him why old men chase young girls. The local, Don Jose, replies, "We all dream of being a child again, even the worst of us. Perhaps the worst most of all." I have spent time with older men who are involved with much younger women. In my experience, they uniformly expect that their partners will make them feel younger, and they are uniformly mistaken. The gaps between their memories, their assumptions and their physical conditions, and those of the women they are dating, remind them constantly of their age. They feel embarrassed and defensive, and worse than either of these, they feel mortal. And yet this dream of being a child again, and this idea of how to accomplish it, persists. His hand pinches at hers, but she does not pull hers away. She acknowledges and accepts their bond. 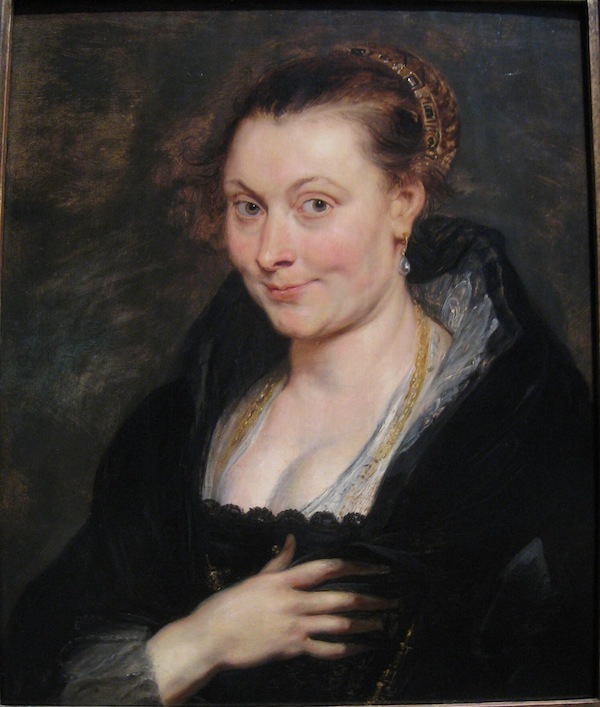 I will go farther than Rubens will: she loves him, as other paintings he made of her make clear. This painting is not about her feelings, it is about his fears and certainties. He is certain that he has at least this much of her, that her hand should rest lightly on his. More than that, he will not assume in this painting. What does her hand hold? A kind of umbilical child-leash. 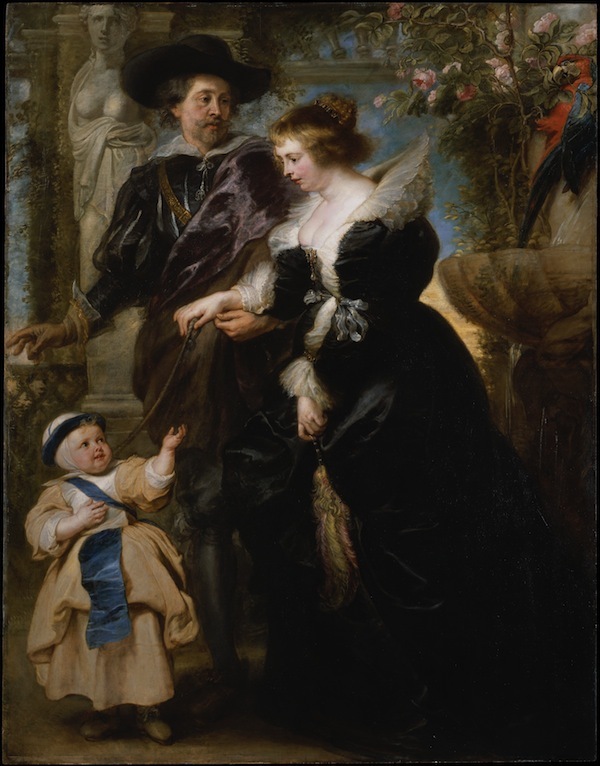 Rubens grasps at Hélène, and Hélène holds onto their shared possession, her other gift to him: their son Frans. Here is self-confident infancy, adoring his mother as Rubens adores her, but without the fears and doubts. He takes the return of his love for granted in a way that aged, infirm Rubens cannot. This painting is not a story of three people together, but of two pairs of two: Frans and Hélène, and Rubens and Hélène. Of course, she loves both her men, but only Frans feels safe in her love. Rubens understands aging and dying. Nothing will ever make him feel personally safe again, because he is not personally safe. And yet he is familially safe, and spiritually safe. This is the revelation of the painting. He proceeds from his age, to the impact of his age on the dynamics of his family, to the meaning of his family for him in light of his aging. What he finds from observing his family is escape from his condition. There will be no recovery of childhood, as Don Jose discussed. But life itself will go on. His wife's youth will extend beyond his own demise. He recognizes her mortality, and that he will not have to endure it, as he did Isabella Brant's. 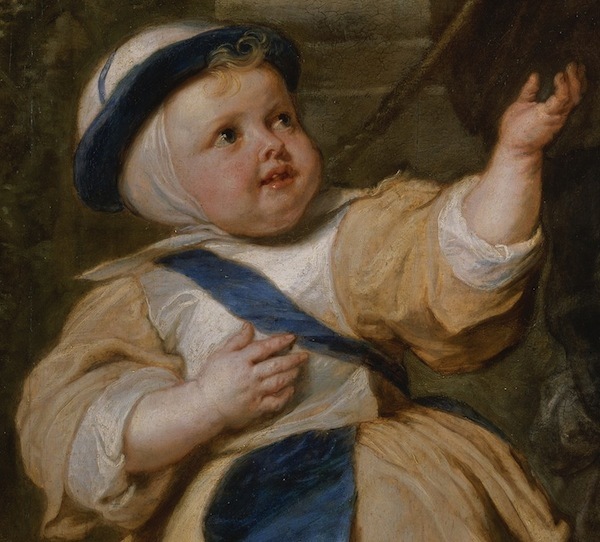 Beyond the two of them, his own flesh will persist, revived, not in himself but in his son, physically carrying the banner of Rubens into the next age. This is a painting about the vanity of accomplishment and wealth relative to the project of youth and immortality. Look at the finery of the props and sets, and the sensuality of the paint! -- and yet they can do nothing for Rubens's ruined jawline. And it is a painting about the redemptive force of love and family, as painful and humiliating as it is for the old to love the young. It is a painting about letting go of unreachable ambitions and valuing real blessings. As such, it is a painting about the oncoming of wisdom. It is probably the most moving trophy wife painting in the history of art. Now, what was I doing talking with Walter Liedtke about this painting? He was one of the curators who recently completed a really mind-blowing renovation of the European painting galleries at the Met. If you know the Met at all, these are the galleries you hit when you go up the main staircase and through the room with those huge Tiepolos lounging around in it. There was a press preview for the renovated galleries, which was the first press preview of an art thing I've ever gone to, because the galleries were already amazing before the renovation, and I was dying to see what could be done to improve them. The curators attended this preview and braved questions from the press. - The area has somehow been expanded, possibly using Time Lord technology. - The walls have been painted in intimidatingly classy muted midtones. - More paintings are on view, both pieces from the Met's collection, and loans made in celebration of the renovation. - Many of the paintings you know and remember have been moved around, so that walking through the section is a series of surprises, like running into the guy from the bodega on the subway or a yoga classmate in the magazine aisle at Barnes & Noble. * This rearrangement owes to the most important facet of the renovation, which is the layout. The collection has been arranged to reflect linkages of paintings by period, origin and art historical trend. This triple mapping is almost impossibly clever, and is a remarkable achievement on the part of the team of curators who devised it. I am at a loss as to how it was done. It rationalizes the collection. It gives it a clear purity in relation to the old layout like a conservator's removal of darkened varnish does to a previously muddy painting. It is, in fact, a little too clean and bright for me -- it is in the same state as the High Line, New York's elevated west side train track, recently restored as a public park. Both the galleries, and the High Line, are currently so impossibly beautiful as to seem not quite real. But that's new things for you. Time will tatter them up a bit: the benches on the High Line will scuff, and curators will wedge paintings into odd and unreasonable corners at the Met. They will age and ripen a bit, just as we, their publics, will sand down the edges of our experiences of them through familiarity. Then we will walk amicably through the park and the museum, both of them better than they were before. What a magnificent city this is. - This whole article is, in a sense, about the renovation. I don't have that much to say directly about it. To keep from writing a very short piece, bottom-heavy with cheap jokes, I wrote up one painting that especially struck me as I walked through the galleries. This analysis conveys a bit of the unique richness of the galleries overall. By this, I mean that Rubens, His Wife Hélène Fourment, and Their Son Frans is just one of many -- many! -- treasures hosted by the Met. Each of them offers a unique encounter to the viewer, ranging from delight to salvation. This article is one of a thousand that could be written. To write yours, you must go and find your own painting in those mighty rooms. *I don't actually do yoga, so the scenario is in the category of speculative fiction.